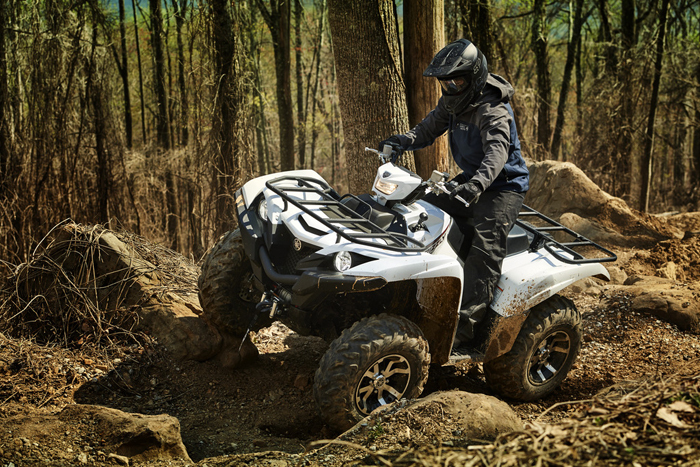 Yamaha Motor Corp, USA is expanding its family of Proven Off-Road multipurpose ATVs adding the all-new 2018 Kodiak 450 to its line of premier Kodiak and Grizzly ATVs. Built in the USA at Yamaha’s state-of-the-art factory in Newnan, Georgia, the 2018 Grizzly-Kodiak family of adventure-seeking multipurpose ATVs are the most durable, reliable and fun to ride in their class with legendary Yamaha quality and performance features. The new Kodiak 450 combines Yamaha’s legendary durability and reliability with class-leading handling. 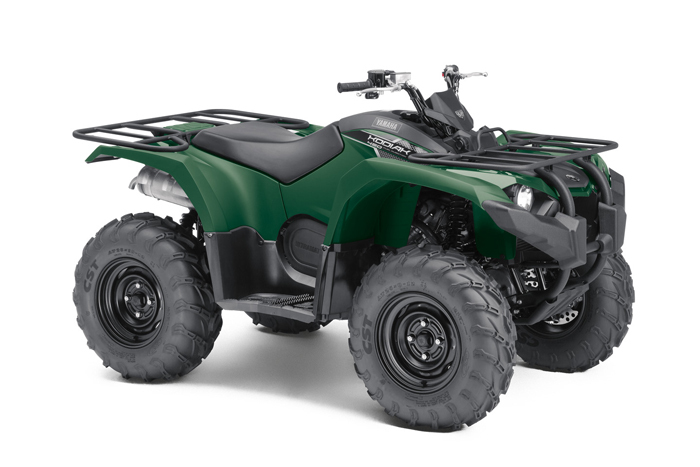 Powered by a 421cc Yamaha fuel-injected engine for Proven Off-Road performance, its all-new chassis features a compact-footprint that mid-size ATV customers will appreciate, along with an extremely roomy riding position to comfortably accommodate even larger riders. Delivering a Proven Off-Road level of capability, comfort and confidence only available from Yamaha, REAL WORLD Tech features on the Kodiak 450 include: Ultramatic® automatic transmission with high, low, reverse and neutral, providing the industry’s most durable continuous variable transmission (CVT) and the most natural-feeling engine braking throughout the RPM range, On-Command® 2WD/4WD system, Electric Power Steering (EPS), adjustable dual A-arm suspension and more. Developed with accessory integration in mind, the Kodiak 450 is designed for easy installation of genuine Yamaha accessories, including a new highly-integrated winch and mounting plate kit – with wiring already pre-installed by the factory on the Kodiak 450, custom over fenders, gun boot mounts, rack extensions, cooler carriers and more. The Kodiak 700, America’s best-selling utility 4×4 big bore ATV*, is built for both work and play providing a comfortable, confidence-inspiring ride. The 2018 Kodiak 700 line includes a new Tactical Black and Silver Metallic Special Edition (SE) with Yamaha’s legendary On-Command® four-wheel drive system, a new Armor Grey model, as well as Hunter Green, Red and Realtree Xtra® models. Styling, smooth power and low-end torque create the foundation for adding a range of REAL WORLD Tech features, like Yamaha’s Ultramatic® fully automatic transmission and Electric Power Steering (select models), all combining to make the Kodiak 700 the most powerful ATV in its pricing category, while maintaining Yamaha’s legendary durability and Proven Off-Road performance. MSRP for the Kodiak 700 starts at $6,999. Boasting superior handling, comfort and performance purpose-built for exploring, hunting and recreational riding, the Grizzly is the best-selling Recreational 4×4 big bore ATV in America*. Designed to be the most comfortable, off-road capable and durable, the 2018 Grizzly comes in a new Silver Metallic Limited Edition (LE) model featuring painted plastics, special graphics, machined aluminum wheels, removable fairing with windscreen, heated grips, thumb warmer and heated seat. A new Matte Carbon SE model features machined aluminum wheels, painted bodywork and special graphics. Standard Grizzly models are available in Graphite, Alpine White and Yamaha Blue featuring machined aluminum wheels for 2018. All Grizzly models feature aggressive styling, a handlebar-mounted work light, 26-inch tires, twin-piston four-wheel disc brakes, superior suspension, and Yamaha’s REAL WORLD Tech features: Ultramatic® transmission, EPS, and On-Command® with a fully locking differential, and more. The 2018 Grizzly delivers optimized engine character for the recreational rider via a 708cc engine at an MSRP starting at $9,699. Yamaha’s full-size ATVs are proudly Assembled in the USA at Yamaha’s state-of-the-art manufacturing facility in Newnan, Georgia, for worldwide distribution. Utilizing Yamaha YZ-style fully adjustable piggyback shocks, the Raptor is a versatile machine capable of handling any terrain – from tight, twisty trails to wide open deserts. Lending to the terrain-taming prowess, front wheel travel is 9.1 inches, with 10.1 inches in the rear. A plush seat, dual counter-balancers, electric start, and reverse are added features on Raptor 700R for all-day riding comfort and convenience. As America’s best-selling 450-class sport ATV** and reigning MX and GNCC champ, the unrivaled, raceinspired YFZ450R also gets a new SE in White (MSRP $9,299) with a GYTR front grab bar. 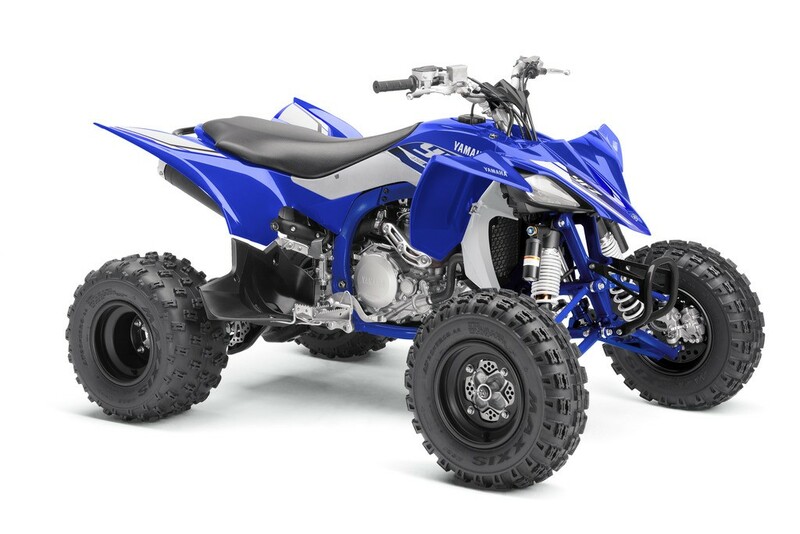 The Team Yamaha Blue / White YFZ450R (MSRP $8,999) now comes with a Team Yamaha Blue seat and color matched A-arms and frame. 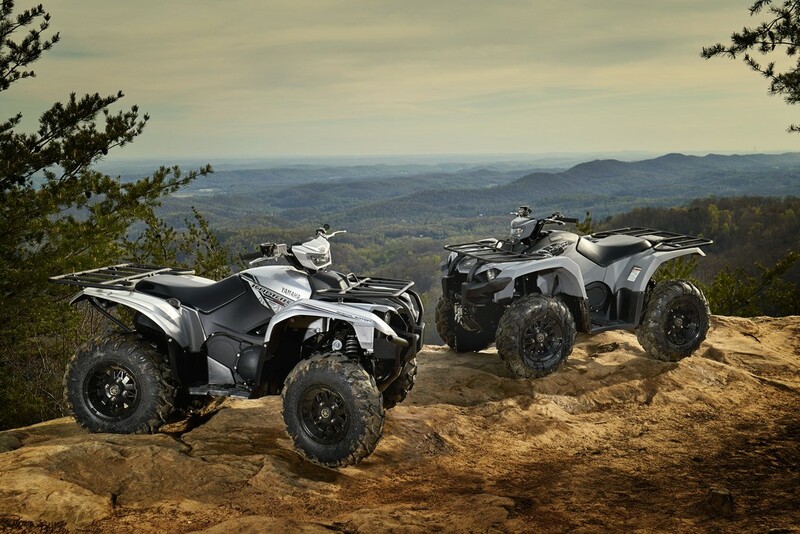 The popular YFZ50 and Raptor 90 youth ATVs to its 2018 model year lineup. 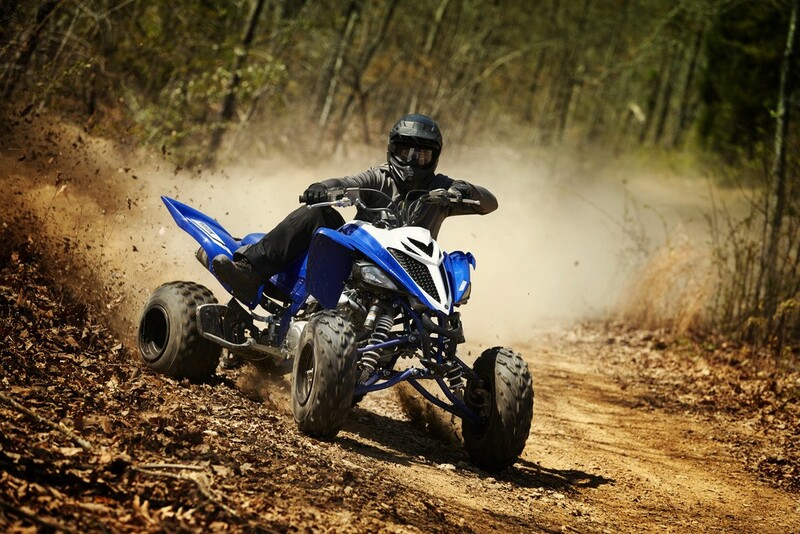 The YFZ50 introduces the fun and exciting world of sport ATVs to riders ages 6 and up, while those age 10 and up can continue to hone their ATV skills aboard the Raptor 90. 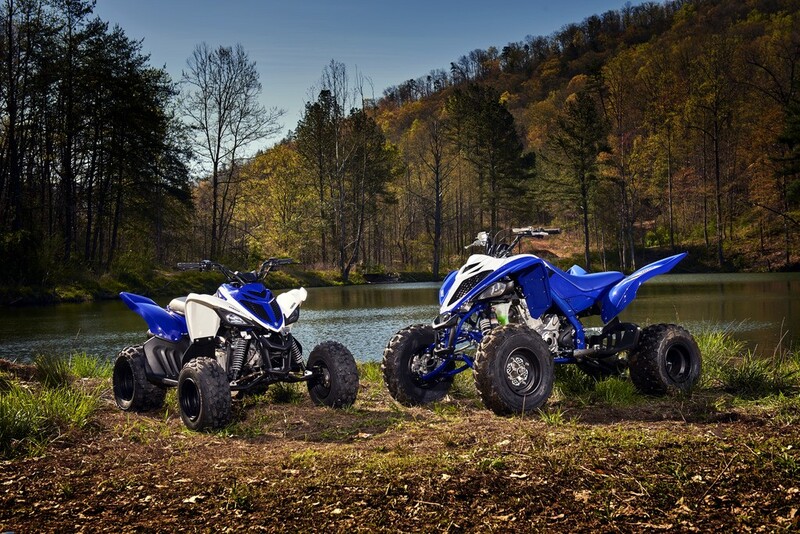 With sporty styling based on the championship-winning YFZ450R and top-selling Raptor 700R, these entry-level ATVs bring Yamaha’s Proven Off-Road sport ATV performance, legacy and quality to the entire family and next generation of budding motorsports enthusiasts. Designed to meet Yamaha’s style and industry-leading performance standards, the electric-start YFZ50 mounts a 49.4cc engine and continuously variable transmission (CVT) on a lightweight chassis, resulting in an entry-level machine that combines an exciting acceleration feeling, with a comfortable ride to help first-time riders develop their off-road abilities. Parents can feel confident introducing their 6-year-old to ATV riding with supervisory controls integrated into the machine, including adjustable RPM and throttle limiters, as well as a tether switch capable of shutting off the engine from a pull-string if or when needed. The Yamaha Raptor 90 is also equipped with a CVT transmission, yet steps up the fun with an 89.9cc engine, providing versatility on the trails while maintaining a smooth, linear power delivery. Additional features include single A-arm front suspension, mono-shock swing-arm rear suspension, and 18-inch tires with lightweight matte black wheels to optimize performance and styling for advancing riders. 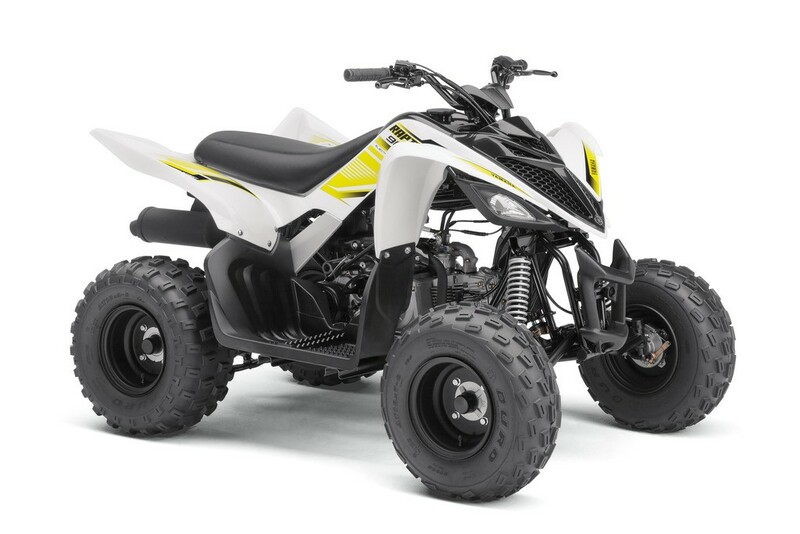 Both youth ATV chassis incorporate a comfortable and roomy rider position to allow young, developing enthusiasts the ability to grow and adjust their riding posture and position while affording years of enjoyment. Specially designed shocks, with youth skills and weight in mind, provide superior handling and comfort, increasing the fun and performance of the ride. The 2018 YFZ50 comes in Team Yamaha Blue and White at a $2,099 MSRP. The 2018 Raptor 90 comes in two color options: Team Yamaha Blue / White, and White, both at a $2,899 MSRP.